When accuracy, minute details, and preservation count, the unparalleled archival quality of Pigma Micron pens makes them everyone’s first choice. Artist, writers, and illustrators reach for Pigma Micron and know their work is safeguarded with the permanence of Pigma ink. 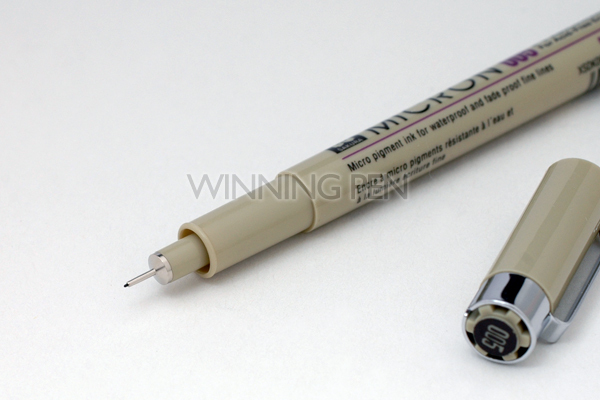 The first disposable technical pen using archival pigmented ink, Pigma Micron ink pen is selected for fine-point technical and artistic applications. Sakura invented and patented PIGMA® ink over 25 years ago. A formulation of pigment based inks, more complex and stable than dye based inks, PIGMA® ink has become the standard for what is defined as reliable, permanent, archival quality ink. Learn more about Pigma Inks. Experience smooth, skip-free writing and crisp ink colors that leave consistent lettering and lines every time. Choose from the SSS range of 3 for precise line widths: 01 = 0.25 mm, 03 = 0.35 mm, 05 = 0.45 mm. Available in Black, Brown and Red. Micron Pen Color Chart.